AUTODROMO NACIONALE DI MONZA – Monza, Italy - TBS - travel agency for all your travel needs in the Czech Republic! The circuit in the Royal Park in Monza was rebuilt a number of times in several years, and slowed down by the addition of chicanes. It has a completely unique atmosphere thanks to thousands of Italian supporters, boisterously supporting Ferrari racers. Despite the chicanes, this is the fastest world championship circuit. 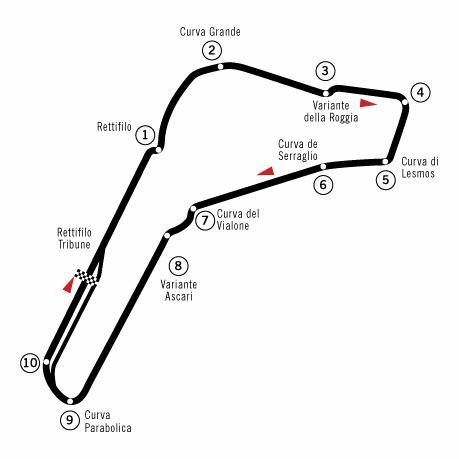 Safe overtaking is possible only on the approaches to the Variante del Rettifilo (at the end of the finish line straight) and the Cariante Ascari chicanes. Drivers’ attempts to achieve maximum speeds lead to reduced manoeuvrability in curves and chicanes. > With an average speed of 250 km/h, Monza is the fastest track in the F1 GP calendar. > Peter Gethin’s win in 1971 remains the closest triumph in GP history. The first five racers finished within 0.61 seconds of each other. > A total of 83 Italian racers have presented themselves in Formula 1 championships, but just two (Nino Farina and Alberto Ascari) have become world champions. In Monza, only three Italians have won F1 races – Farina, Ascari and Ludovico Scarfiotti. > Ferrari has won its home Grand Prix a total of 17 times.